A team of researchers from Spain, Hungary and Poland has found via a study with infants that language may not be a necessity for the ability to reason. In their paper published in the journal Science, the group describes their study and what they found, and also offer some opinions on how their findings might be used to better understand the ability to reason. Justin Halberda with Johns Hopkins University offers a Perspective piece on the work done by the team in the same journal issue. For many years, cognitive scientists have generally agreed that language is required for reasoning—in order to make sense of a scene, for example, a person might talk it over in their mind. But that might not actually be the case, as the researchers in this new study have shown. They enlisted two groups of volunteers, one consisting of infants 12 months old, the other of 19-month-old babies. Each of the volunteers watched videos, some which seemed to make sense logically, and others that did not. The researchers observed the participants' reactions. 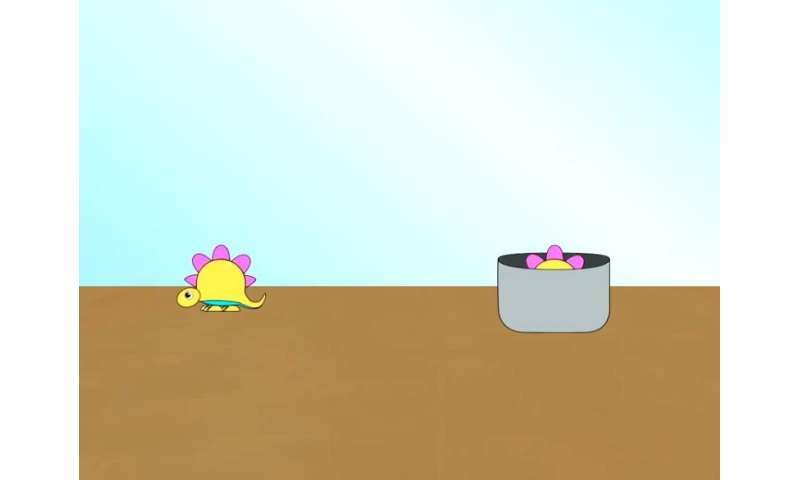 The videos showed animated characters—initially, there were two of them, such as a dinosaur and a flower. 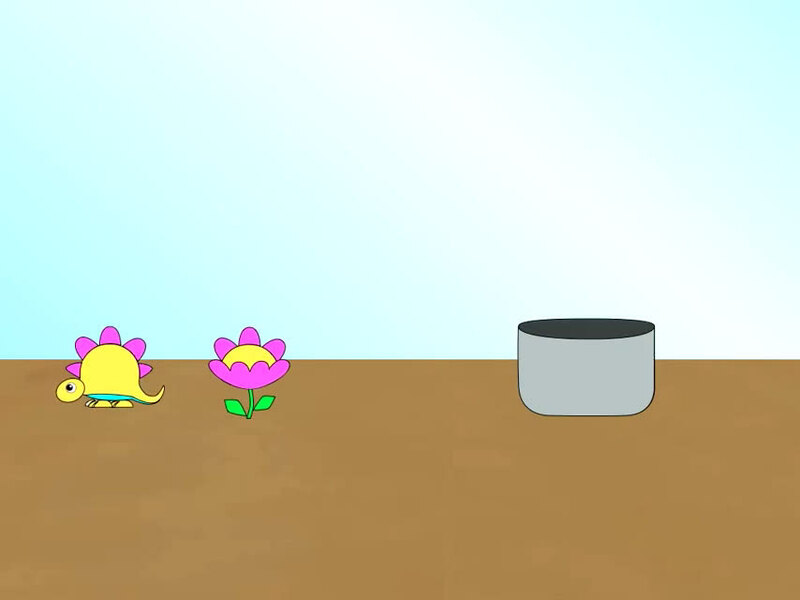 Then the characters would be hidden behind a screen followed by a cup scooping up one of the characters. Then the screen would drop, revealing the second character. Sometimes it would be the expected second character, but sometimes it would not—it might be a second instance of the first character, or a different character altogether. To judge whether the infants were trying to make sense of the scene before them, the researchers monitored their eye focus—babies that are confused tend to stare longer. The researchers report that the infants did, indeed, focus longer on the second character when it was not the one they expected to see. This is an example, the researchers claim, of evidence of reasoning. They note that in addition to offering evidence that language is not necessarily required for reasoning, the test they developed could potentially be to test for cognitive disability in infants. 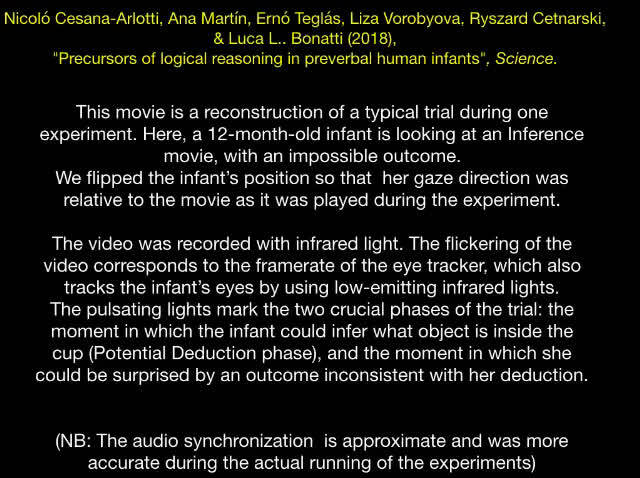 Infants are able to entertain hypotheses about complex events and to modify them rationally when faced with inconsistent evidence. These capacities suggest that infants can use elementary logical representations to frame and prune hypotheses. By presenting scenes containing ambiguities about the identity of an object, here we show that 12- and 19-month-old infants look longer at outcomes that are inconsistent with a logical inference necessary to resolve such ambiguities. 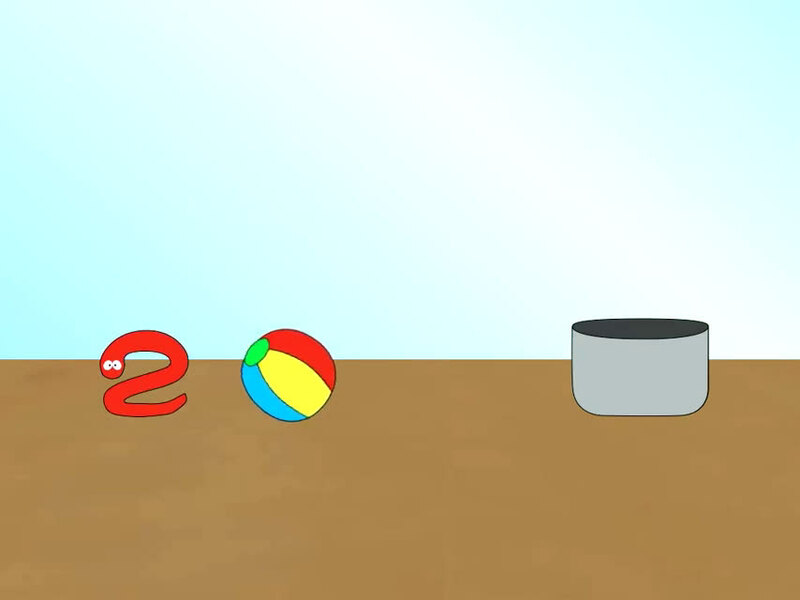 At the moment of a potential deduction, infants' pupils dilated, and their eyes moved toward the ambiguous object when inferences could be computed, in contrast to transparent scenes not requiring inferences to identify the object. These oculomotor markers resembled those of adults inspecting similar scenes, suggesting that intuitive and stable logical structures involved in the interpretation of dynamic scenes may be part of the fabric of the human mind. Very cool. But isn't it obvious that animals reason without language? Why shouldn't humans? I was hiking with my dog in the White Mountains. The trail was covered with leaves, so you couldn't see it. But my dog could smell it, so I just followed him. We came to this huge boulder with a tunnel in it. I was surprised because I'd never hiked the trail before. My dog sniffed to the left of the boulder. Then he sniffed to the right. And then - without sniffing - he dashed through the hole. Pretty advanced reasoning for a "dumb" animal. They enlisted two groups of volunteers, one consisting of infants 12 months old, the other of 19-month-old babies. Hang on! These infants are 'volunteers' so they 'volunteered' for this! How did they express their permission for participating in this experiment and what motivated them? They must have far greater reasoning ability than we thought. Of course! We think largely in images, not language, we translate thoughts into language when we wish to communicate them, or further refine them, for instance when writing. I have done some personal 'awareness' training in this, being objectively aware of thoughts. Animals, as has been pointed out, who have limited 'language' as we understand it, clearly think without it; problem solve & react to signals and sounds. And when humans first created language, they had to have thought of it previously! Well, people born deaf, who shouldn't have a language as the rest of us do - as a verbal representation of thought, also can reason /and as much as I know, they also are able to function more or less normally before learning to read and write/, don't they? Did somebody missed that?